Scott Kazmir has been on people’s radar since he was drafted by the Mets out of high school in 2002. 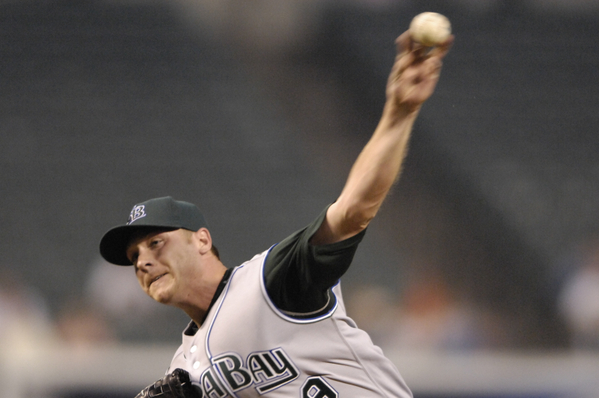 I’ll try not to rehash too many bad memories for Mets fans, but he was later traded to the then-Devil Rays. After only a few more games in the minors, Kazmir was called up and has been at the top of the Rays rotation since. Kazmir, at six feet, is somewhat short for a pitcher, but he makes up for that with brilliant stuff, knowing how to pitch, and of course, being left handed. With the Rays making the playoffs this year he will have an opportunity to show the nation what he can do on the biggest stage. Kazmir is a pretty typical lefty in terms of the types of pitches he throws. Kazmir has a fastball, slider and change-up. Here is a look at the movement he gets with these pitches. Kazmir’s best pitch is his fastball, and you can see why quickly by looking at his PITCHf/x averages for that pitch. He throws it a tick under 93 mph, very good especially for a lefty, but it also has exceptional movement. Kazmir’s fastball averages almost six inches of horizontal movement, boring in to a left-handed batter and having more than 10 inches of vertical “rise” compared to a ball thrown without spin. All three of these things are well above average, making Kazmir’s fastball one of the most complete pitches in baseball. As you would expect, he uses this weapon quite frequently, throwing it more than three quarters of the time. To begin the at-bat, he throws his fastball 83 percent of the time, so batters have to be aware that it is coming, but still can’t do much with it. This is a nasty, nasty pitch. Kazmir’s off-speed pitches aren’t quite as strong. To left-handed batters, he prefers a hard slider that checks in at 83 mph. This slider, however, offers very little movement either horizontally or vertically (-0.4 and 4.0 inches respectively). Regular readers will know that I am not a big fan of sliders like this; it appears they are more effective if a pitcher can start them at the outer edge of the plate and have them move out of the zone. This certainly applies to Kazmir, with the little movement he has, but he still is getting a lot of swings and misses with the slider especially with pitches out of the zone. So why does it seem like Kazmir can get away with this when other pitchers can’t? The difference here is that Kazmir’s fastball tails in so hard to left-handed batters and he throws it so often, he can fool hitters into this pattern. Then, when he throws a slider that begins out of the zone and doesn’t move much, the hitter is expecting it to bend back over the plate. This is magnified by Kazmir’s choice of when to use his slider. He rarely breaks it out until he gets the hitter in a hole with two strikes and needing to protect the plate. Then out comes the slider, and he gets his swings and misses. I still would like to see more movement from this pitch, and it might be coming. Kazmir is still young and his slider has the potential to go from an effective two-strike pitch to being a lefty killer at any count with a little more movement. While reports say Kazmir has some trouble controlling his change-up, I think it’s the future for him. The difference from Kazmir as the excellent pitcher he is now to Kazmir as one of the top pitchers in the game is whether he masters that change-up. The tools are all there; his straight change offers very similar horizontal movement to his fastball with less vertical movement. This means the spin of the two pitches is similar, making it hard for a batter to detect but making the pitch drop before getting to home plate. Here is a look at his average change-up and average fastball from the side to show what I mean. Notice how late the two pitches stay on top of each other and then how much they differ when they actually get to home plate. With similar spins and with them overlapping so much, it is that much more difficult for a hitter to pick up. Notice one other thing: Kazmir is throwing his change-up from a slightly lower release point than his fastball. Because the change-up is thrown slower, it is going to produce a larger hump than his fastball. If he released both pitches from exactly the same point, the change-up would rise above the plane of the fastball, potentially tipping it to batters. Kazmir has picked the perfect release point with his change; the pitch perfectly merges with his fastball before diverging at the end. One last thing about Kazmir’s change-up: He throws that pitch under 80 mph on average, which produces an absolutely silly difference between his fastball and his change-up. We have previously seen how effective a large speed differential is, and Kazmir’s is one of the best in the game. Putting it all together, you have a pitch that has nearly limitless potential. Like most lefties, Kazmir uses the pitch only to right-handed batters, but his change-up could be nearly unhittable if he could control it a little better. Now, he is using it as a setup pitch, throwing it the most on 1-0, 1-1 and 2-1. I’d like to see him use it more often with two strikes to right-handed batters; this change-up projects to be a much better pitch to right handers than his slider does. If some of what you have read here reminds you of what I wrote about CC Sabathia, it should. They both are lefties, they both have plus fastballs, they both throw a change to right-handed batters and a slider to left-handed batters. Obviously Sabathia is more advanced, but he has years on Kazmir. While Kazmir likely never will have the slider that Sabathia has, his change-up has the potential to be a better pitch than Sabathia’s. Because teams like to stack their lineups with right-handed bats against these two, the change-up probably is the more important of the two pitches anyway; Kazmir should be able to do quite well with his fastball against lefties. Scott Kazmir has taken a step forward this year and the potential is there for him to take another step, bringing him to the very top of the game. He throws only three pitches, but all are effective. If he gains a little more control and more feel for his change-up, look out.